Back On The Market due to buyer financing & priced below recent appraisal!! This lovely three way split flexible floor plan will provide space for all your needs. As you enter the home through double leaded glass doors, your eyes will be drawn to the beautiful pool & outdoor living space w/ no back neighbors. The formal areas feature coffered ceilings w/ crown molding. The spacious kitchen is a chef's dream w/ granite tops, breakfast bar, center island, tile backsplash & stainless appliances including cook top, dishwasher, built in convection wall & microwave ovens & eat in area overlooking the pool. The family room is adjacent to the kitchen w/ a cozy fireplace & triple sliders that open to the outdoor living space. The master suite is privately located on one side of the home w/ large walk-in closet, french door access to pool, updated master bath & flex room currently set up as an office but could also become a work out room, nursery or a dreamy woman cave closet. Two bedrooms are located on the other side of the home w/ a full bath. Off the kitchen area is an amazing game room w/ wet bar & full bath. At the back of the home is another flex room/bonus room w/ adjacent bedroom & ensuite bath. 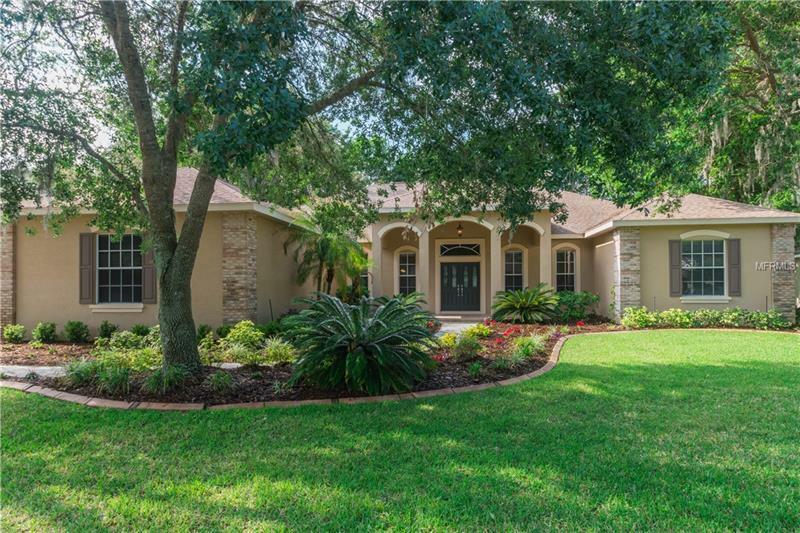 Sitting pretty on a half acre fenced lot w/ private wooded view in the sought after gated, guarded 24/7 community of Fish Hawk Trails w/ outstanding schools (busing available) wooded trails, tennis courts, basketball courts, parks/playgrounds & clubhouse for neighborhood gatherings. Make your appointment today!